Burial grounds require safety support systems. 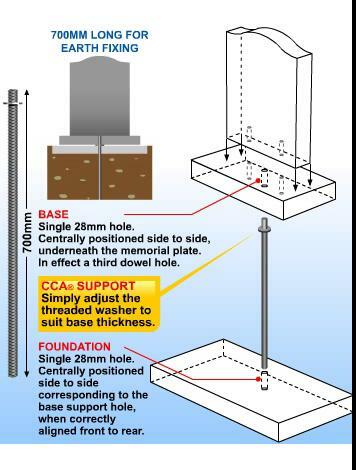 CCA® FIXINGS developed the C.C.A.® (Central Collapsable Support) in response to this requirement.Our solution requires NO CEMENT, ADHESIVES or RESIN REQUIRED. The support is fitted simply and easily through a single pre-bored hole in the base and foundation. The C.C.A.® Support’s stability has been tested to a 150kg force meeting safety standards. 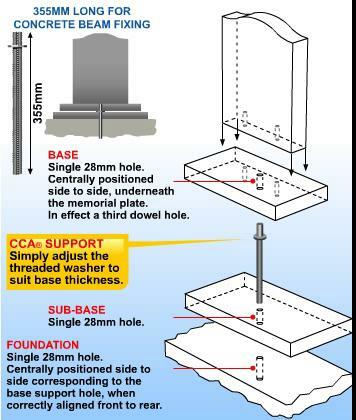 The animation on the left illustrates the ground anchor providing a resistive force to support the memorial and prevent it falling as a force is applied. Designed for soft earth fixing. Designed for soft earth fixing, bigger bases and double bases. Designed for concrete beam fixing.